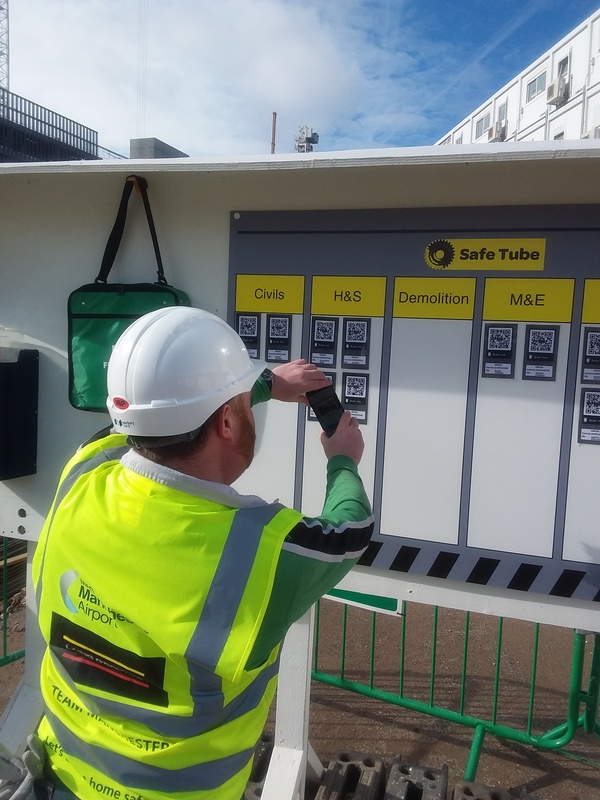 The concept behind SafeTube is to provide a visual demonstration via a video of work-related activities which are easily accessible to operatives on site. These are used to supplement existing paper RAMS and Task Sheets. There are two functions behind SafeTube. One is to provide a ‘storyboard’; this breaks a process down into its individual components from start to a finished product or a construction activity. The second function is for it to be utilised to reinforce the best safe working practices for activities which are transferable for all trades on site. While construction processes are constantly evolving, site documentation has not. The use of SafeTube is the next step in the evolution of paperwork. While not replacing the requirement for traditional RAMS, it has greater usage and benefits to operatives on site. All SafeTube videos are accessible via a QR code and can be viewed on a smartphone or tablet with internet connection. There is a board at the site entrance with all the QR codes produced. The videos highlight the hazards associated with each activity, the best control measures that must be applied, required PPE, plant and equipment and pre-start work preparation. Improved quality, health and safety. Reusable – while all projects are unique, some construction processes remain the same. Can be utilised as a better, more visual way of toolbox talks. Can help overcome language barriers – through the use of videos, tasks can be explained easier to operatives who do not speak English as their first language. The videos can be translated as required.